Download "Success in Change. 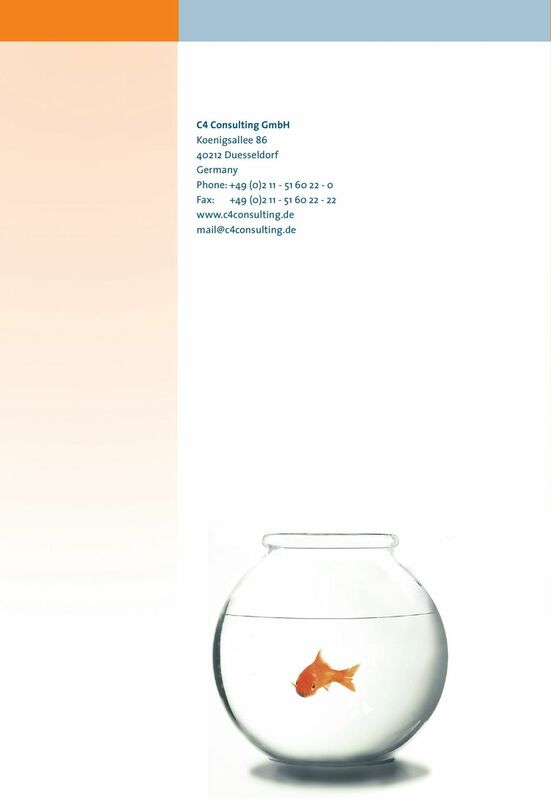 Anabel Houben Carsten Frigge C4 Consulting GmbH. 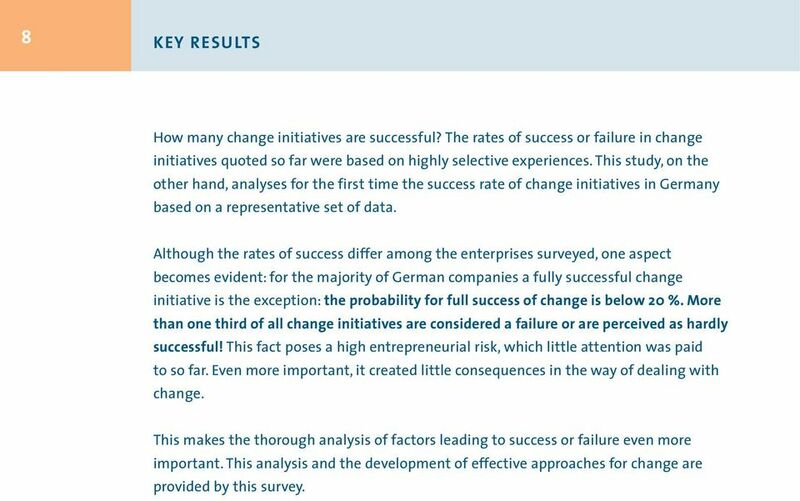 Representative Survey on Success and Failure in Managing Change"
5 KEY RESULTS 5 Motivation People s motivation has the strongest influence on the success of large-scale change initiatives. This comes to no surprise. However, in practice hardly any conclusion is drawn from this insight. If people s motivation to change is low the probability of failure for the change project is high. The more eager people are to make the change happen, the higher the success rate. 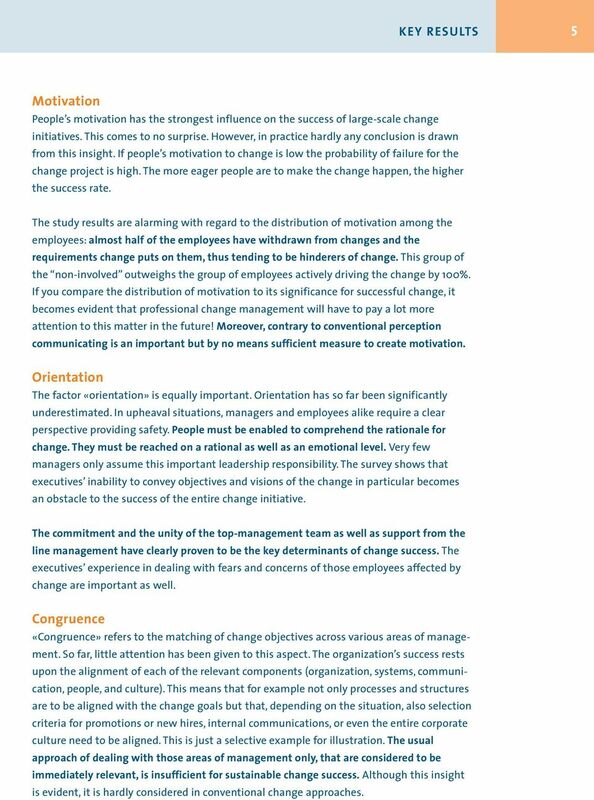 The study results are alarming with regard to the distribution of motivation among the employees: almost half of the employees have withdrawn from changes and the requirements change puts on them, thus tending to be hinderers of change. This group of the non-involved outweighs the group of employees actively driving the change by 100%. If you compare the distribution of motivation to its significance for successful change, it becomes evident that professional change management will have to pay a lot more attention to this matter in the future! Moreover, contrary to conventional perception communicating is an important but by no means sufficient measure to create motivation. Orientation The factor «orientation» is equally important. Orientation has so far been significantly underestimated. In upheaval situations, managers and employees alike require a clear perspective providing safety. People must be enabled to comprehend the rationale for change. They must be reached on a rational as well as an emotional level. Very few managers only assume this important leadership responsibility. The survey shows that executives inability to convey objectives and visions of the change in particular becomes an obstacle to the success of the entire change initiative. The commitment and the unity of the top-management team as well as support from the line management have clearly proven to be the key determinants of change success. The executives experience in dealing with fears and concerns of those employees affected by change are important as well. Congruence «Congruence» refers to the matching of change objectives across various areas of management. So far, little attention has been given to this aspect. The organization s success rests upon the alignment of each of the relevant components (organization, systems, communication, people, and culture). This means that for example not only processes and structures are to be aligned with the change goals but that, depending on the situation, also selection criteria for promotions or new hires, internal communications, or even the entire corporate culture need to be aligned. This is just a selective example for illustration. The usual approach of dealing with those areas of management only, that are considered to be immediately relevant, is insufficient for sustainable change success. Although this insight is evident, it is hardly considered in conventional change approaches. 6 6 KEY RESULTS Organization Structures and Processes Systems Reporting and Controlling Systems Roles and Responsibilities Management Systems IT Systems Culture Values and Norms Corporate Culture Communication People Aligning Communications Decision and Reconciliation Mechanisms Selection Criteria Incentives Selective corporate components that need to be aligned to the change initiative The study results are obvious: soft factors, which in practice are often neglected, are as important as hard factors for the success of large-scale change initiatives. Nevertheless, the hard factors are regularly in the center of the attention. Decisive project management, sufficient financial funds and human resources alone do not guarantee the success of the implementation. These components need to be supplemented by the soft factors (communication, people, culture). The relationship of hard and soft factors in a congruent system of objectives sets the framework for successful change. 2. What are the key reasons for failure? 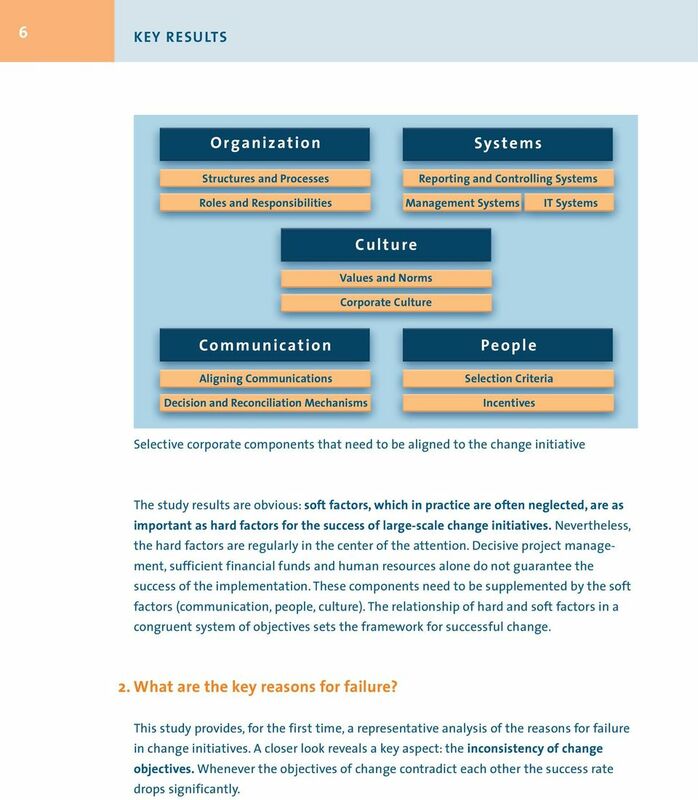 This study provides, for the first time, a representative analysis of the reasons for failure in change initiatives. A closer look reveals a key aspect: the inconsistency of change objectives. Whenever the objectives of change contradict each other the success rate drops significantly. 7 KEY RESULTS 7 The ten key reasons for the failure of large-scale change in German enterprises: Insufficient commitment of the top leadership team 61 % Unclear objectives and visions of the change process 56 % Lack of leaders competence in professionally dealing with people s fears and concerns 56 % Disunity on the top leadership level (no one-voice approach) 56 % Lack of support from the line management 52 % Incomplete or delayed information to the employees 50 % Insufficient support in coping with fears and resistance 46 % Neglect of psychological factors during project planning 43 % Insufficient human resources Lack of trust in communication between employees and management 37 % 36 % Very relevant or essential Influencing factors in order of relevance to success This underlines the importance of psychological factors. 3. 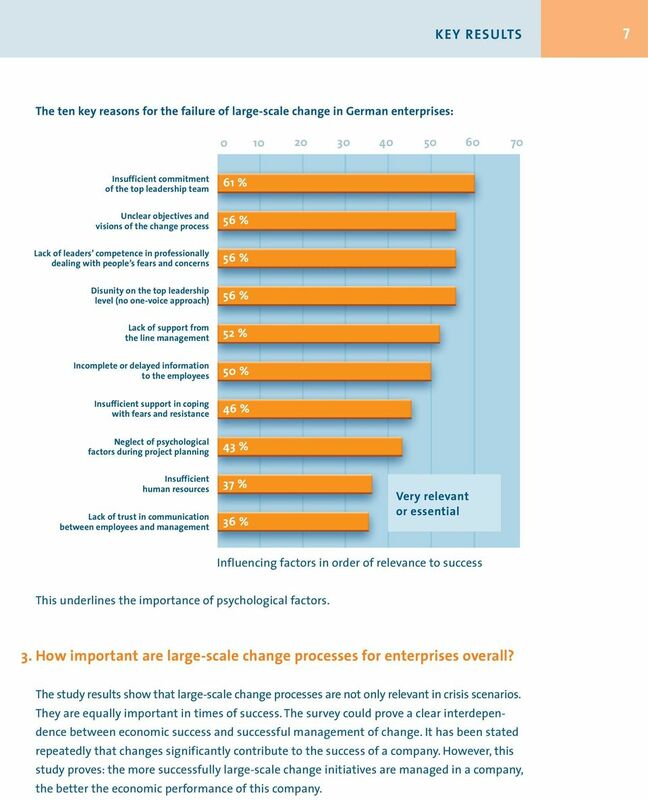 How important are large-scale change processes for enterprises overall? The study results show that large-scale change processes are not only relevant in crisis scenarios. They are equally important in times of success. The survey could prove a clear interdependence between economic success and successful management of change. It has been stated repeatedly that changes significantly contribute to the success of a company. However, this study proves: the more successfully large-scale change initiatives are managed in a company, the better the economic performance of this company. 8 8 KEY RESULTS How many change initiatives are successful? The rates of success or failure in change initiatives quoted so far were based on highly selective experiences. 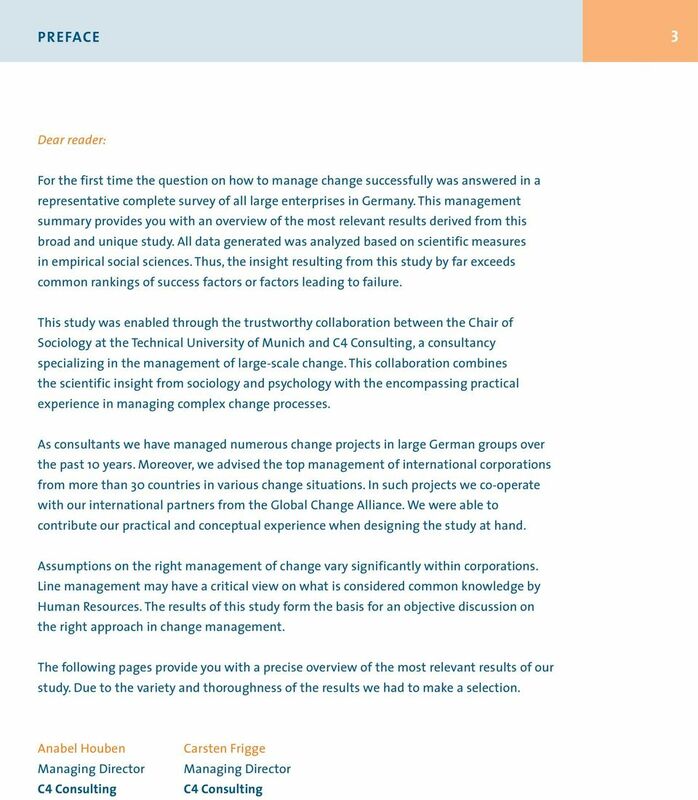 This study, on the other hand, analyses for the first time the success rate of change initiatives in Germany based on a representative set of data. 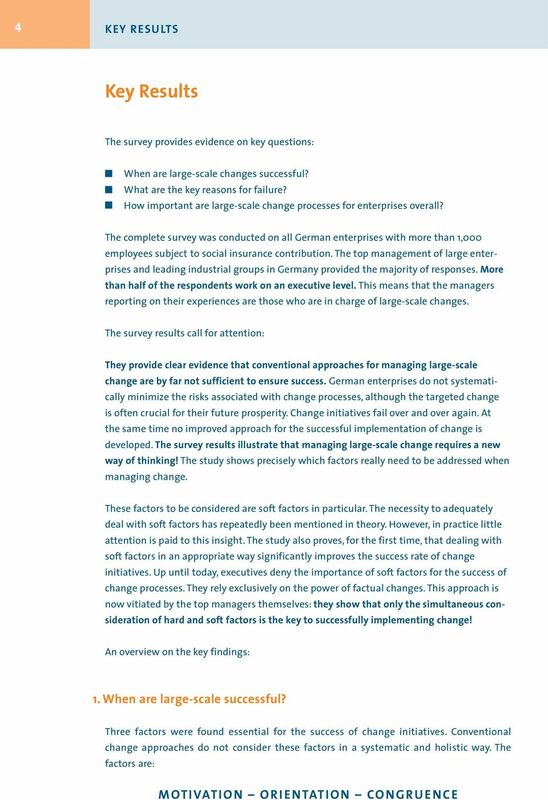 Although the rates of success differ among the enterprises surveyed, one aspect becomes evident: for the majority of German companies a fully successful change initiative is the exception: the probability for full success of change is below 20 %. More than one third of all change initiatives are considered a failure or are perceived as hardly successful! This fact poses a high entrepreneurial risk, which little attention was paid to so far. Even more important, it created little consequences in the way of dealing with change. This makes the thorough analysis of factors leading to success or failure even more important. This analysis and the development of effective approaches for change are provided by this survey. 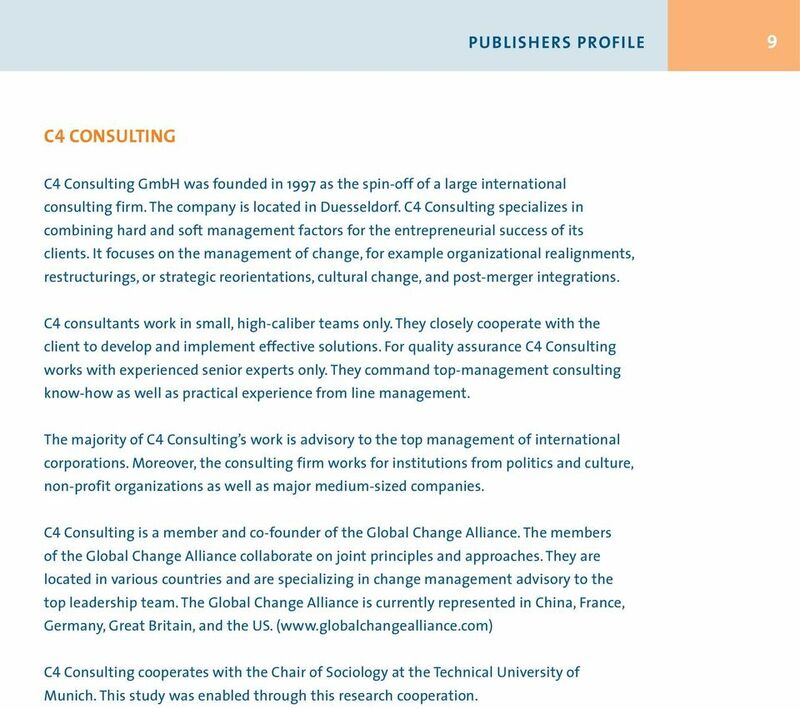 9 PUBLISHERS PROFILE 9 C4 CONSULTING C4 Consulting GmbH was founded in 1997 as the spin-off of a large international consulting firm. The company is located in Duesseldorf. C4 Consulting specializes in combining hard and soft management factors for the entrepreneurial success of its clients. 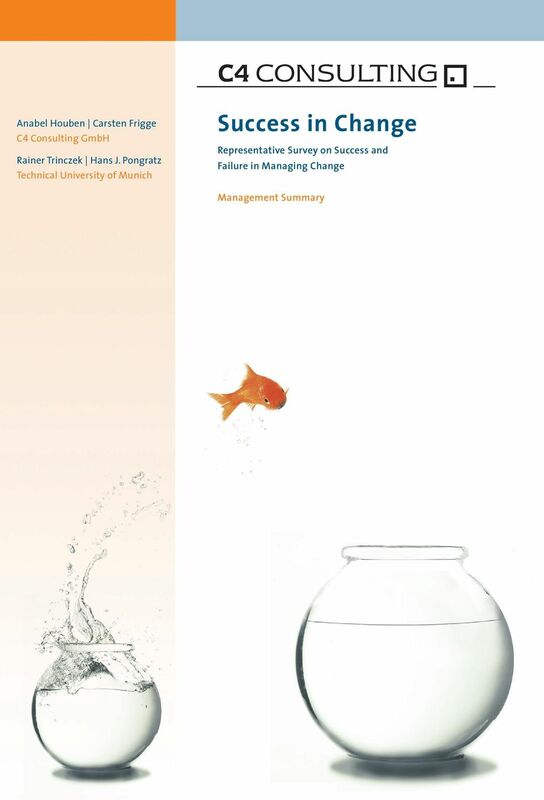 It focuses on the management of change, for example organizational realignments, restructurings, or strategic reorientations, cultural change, and post-merger integrations. C4 consultants work in small, high-caliber teams only. They closely cooperate with the client to develop and implement effective solutions. For quality assurance C4 Consulting works with experienced senior experts only. They command top-management consulting know-how as well as practical experience from line management. The majority of C4 Consulting s work is advisory to the top management of international corporations. Moreover, the consulting firm works for institutions from politics and culture, non-profit organizations as well as major medium-sized companies. C4 Consulting is a member and co-founder of the Global Change Alliance. The members of the Global Change Alliance collaborate on joint principles and approaches. They are located in various countries and are specializing in change management advisory to the top leadership team. The Global Change Alliance is currently represented in China, France, Germany, Great Britain, and the US. 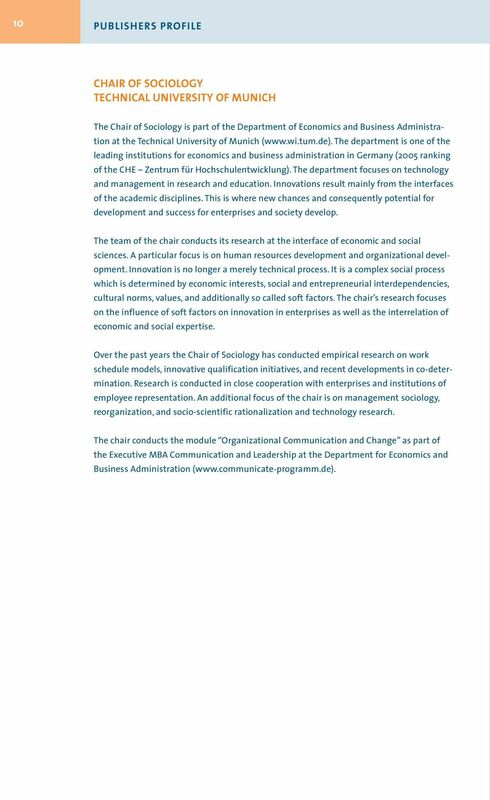 ( C4 Consulting cooperates with the Chair of Sociology at the Technical University of Munich. This study was enabled through this research cooperation. Identity and Access Management. Gain agility through IAM. Squeezing Budgets: Cutting Costs or Cutting Business? 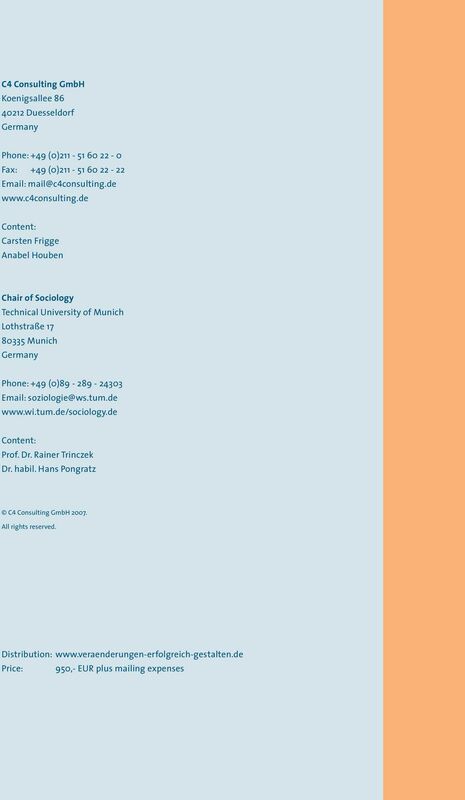 Organizational Behavior and Organizational Change Organizational Culture. Roger N. Nagel Senior Fellow & Wagner Professor. Are European companies ready for customer centricity?